DACAAR is facing some difficult times at the moment. Not only are several expats leaving at around the same time, what’s much worse is that DACAAR is getting the blame for a water dam which collapsed earlier this week. 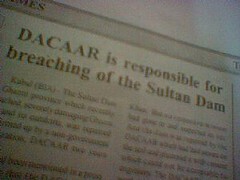 One of the state-run newspapers ran a headline which simply stated that DACAAR was responsible for the collapse, resulting in 15 deaths, two thousand shops being wiped away and the complete loss of the water reservoir. Although DACAAR has done some work on the dam several years ago, it doesn’t appear DACAAR is responsible for the collapse of this 1000 year old dam. But how to reverse these allegations showing up in the national press? Today was my last official day at the office. I will be ‘in’ tomorrow, but only because I feel like being a good guy. Not something that can be said of everyone. It seems my mobile phone has disappeared today, from the office. It was on my desk when I left for a meeting at three. At five, when I came back, it was gone. Calling my phone immediately resulted in a ‘this phone is currently not reachable’. Clearly, someone switched it off. It seems it will be the plan to return to Afghanistan around the first of June, for another two months. It does require the DACAAR IT unit to stick to the project plan we’ve been working on over the past couple of weeks. Not too hard, but it also requires quite a bit of actual work. It will be rewarding to see them sticking to the plan. It does make another planned trip of mine a bit more shaky. This year’s Veto reunion is set to take place close to Durban, South Africa, around the end of June, beginning of July. If I want to attend, I will have to break the project in Kabul in two, sneaking away for a couple of weeks to South Africa.